Knowledge is Power! – Access Control and Circuits. So you’ve created the layout for your facility in order to submit it to the state, but now you are running into the questions like “How many cameras do I need?” or “Where and how do I position my cameras?” Your first consideration should always be the governing authority’s prerequisites, and you’ll find few who are as informed as we here at Security Camera King. We have specialists in both the Washington Initiative 502 and Colorado Amendment 64’s rules and regulations. One of the reasons our customers are so successful at passing the boards and becoming licensed is precise layouts and camera placement. One advantage we offer our Amendment 64 and I-502 customers is a 3D model of your facility. This model can offer you several advantages that you would not otherwise have. First, modeling your layout will give you an edge with the Washington Liquor Control Board or Colorado Department of Revenue by providing them with a precise example of where and how you are establishing camera coverage and security measures. Second, designing this model can provide investors, contractors, employees, and coworkers with a professional rendering or rendition of the vision you have for your business. And finally, modeling will help you with spatial planning by offering you a visual representation of how your grow area will look, work and function including how your surveillance and security systems will fit in. This gives our customers a definite advantage over their competition! Modeling your I-502 or Amendment 64 layout allows you to have advantages normal applicants wont have! What do I mean? Let me be more specific. You can outline camera locations to give coverage from positions that may normally look to be obstructed on a traditional 2-dimensional layout. 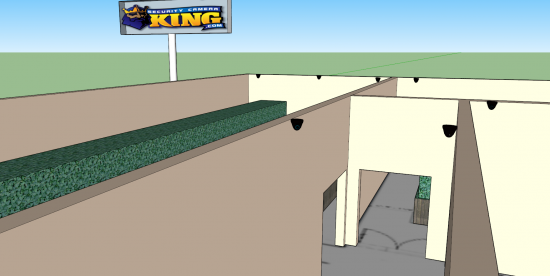 This allows us at Security Camera King to provide our customers with a more accurate camera count. These counts are also far more precise in their coverage, which as a result allows you to express to the governing authority more directly what areas will be visible to the camera. For example, if you have a warehouse with a 15 foot ceiling and a 10 foot high grow, it would appear on a 2D layout as if the camera isn’t covering the full grow or that the camera’s vision is blocked by the grow itself. However, on a 3D sketch up, you can clearly see the camera is overlooking the grow, providing coverage of all persons working on your product. In another example we may find that a camera can cover 2 egress points because of a unique position not normally discernable on a 2d floor plan. This level of detail gives Colorado’s Department of Revenue for Amendment 64 licensees or Washington’s Liquor Control Board for Initiative 502 applicants, a more precise depiction of your intent, allowing for faster approval of applications and licenses. The level of detail a 3D rendering rendering is not just useful to the Liquor Control Board and Department of Revenue alone! Modeling can also assist in providing an example of your idea to investors, co-workers, employees or even contractors during the construction portion. Since we create our 3-Dimensional model after your floor plan, even a layout still in the preliminary planning process can be done long before construction of your facility is complete. Even a pencil drawing with proper measurements included can be converted to a moderately detailed model with relative ease. This allows us to help you to present your intentions to potential investors and clients. It can include specifics of your surveillance and access control solutions, and additionally your facility’s production, processing, and/or sales floor organization. On some projects, we can even create short video clips to expressly present you with the products we are quoting you as well as a 3D walk-through of your facility, in addition to the 3-Dimensional model itself. If you are in a renovation phase, modeling may also help allow you to illustrate where walls will be relocated, rooms portioned, windows paved over, alarm systems placed, and how your layout will change to both contractors and the governing authority. The more detail you present us with, the larger the detail we can include on your quote and model. Even if you are as far along as simply completing your order and placing cameras accordingly on an already state approved layout, a model can help you estimate where you will be laying or running cable and what areas you may have that will potentially be more difficult than others. Modeling will help you with spatial planning and visual preparation, in general, by giving you a more detailed way to estimate cable lengths, in addition to envisioning positions of various other devices and systems. For example, it may be useful in plotting access control locations and to see just which systems will be most beneficial to add security to your facility. There are a few concerns, however, that should be noted when using modeling as with any layout in that it cannot replace a physical walk-through that is necessary with the installation of any equipment. That is to say that the engineering infrastructure of the facility needs to be taken into account, as well as any furniture and accessories that may not be visible on the model or layout when it comes to the installation. Even so, many times these features can be included in the layout or floor plan and even without such features having a 3-Dimensional model is definitely an advantage! Our knowledgeable team can definitely help you answer the questions of “How many cameras do I need?” and “Where and how do I position these cameras?” We can also revise your layout and create a 3D model to give you a real visual and virtual representation of your facility, even if it hasn’t been constructed yet! This will allow you to present your facility to the State with sincere confidence with our guarantee. Not only that, but you now have a 3-Dimensional rendering to present to investors and future clients! We here at Security Camera King are always looking to provide excellence in service to our clients, and this is just one of the ways we show our support!